Middle Easterners are famous for their sweet tooth and I am no exception. I may no longer like chocolate but I still love other sweets, in particular baklava, a generic term describing a range of pastries made with filo or ‘hair’ pastry and filled with nuts and sometimes kaymak (thick cream). However, despite my curiosity for all things culinary from when I was a child, I had never seen commercial baklava being made until I visited the kitchens of Gulluoglu in Istanbul with my dear friend, Nevin Halici, and those of Imam Cagdas in Gaziantep with another dear friend, Filiz Hosukoglu, where an army of sweet-makers were making everything by hand, from rolling the filo to filling and shaping the different types of baklava to drenching it in sugar syrup. And from the very beginning to the very end, the process is mesmerising. 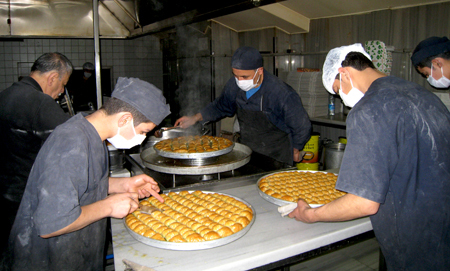 Here are some pictures I snapped in Imam Cagdas’ baklava kitchens where they bake the baklava in a wood-fired oven.